We've mentioned on more than one occasion that it's next to impossible to accurately appraise young stallions until they've at least had a couple of crops at the races. That said, the progress of those with their early crops at the races is always interesting, and a look at this year's current leading freshmen reveals quite a reshuffle from the order at the end of 2014. Speedster Munnings (TrueNicks) has sprinted to the top of the 2015 second-crop list, primarily through the efforts of the excellent filly I'm a Chatterbox, successful in the Rachel Alexandra Stakes (gr. III) and Silverbulletday Stakes. Out of a Lost Soldier mare, I'm a Chatterbox is bred on a version of the very successful Speightstown/Danzig cross, and we'll also note that Lost Soldier is a half brother to the second dam of Munnings. So far, Munnings has six other stakes horses and three other stakes winners—out of daughters of Borrego (the successful Speightstown/El Prado cross), Freud (TrueNicks), and Orientate (TrueNicks). Munnings's studmate Lookin At Lucky (TrueNicks), along with Curlin (TrueNicks) and English Channel (TrueNicks), is one of a troika of young Smart Strike sons that appear at least very useful. Lookin At Lucky already has nine black-type horses, including last year's Iroquois Stakes (gr. III) scorer Lucky Player (out of a Storm Cat mare). He also already has 35 individual winners. Eskendereya (TrueNicks) is still looking for his first stakes winner, but he's tied with Munnings among this group by individual winners this term with 16. He does have two graded-placed horses in the shape of Eskenformoney (dam by Not For Love) and Isabella Sings (out of a mare by the German Nijinsky II line horse Lomitas). Another Storm Cat line horse, Majesticperfection (TrueNicks), is one of this year's gainers with dual stakes winner Majestic Affair (out of a mare by the Dynaformer horse Blumin Affair), and stakes winner Perfect Style (dam by Crafty Prospector). He's also been represented by four other stakes winners, including Lovely Maria and Hebbronville, both runners-up in graded stakes events. Although he was a champion 2-year-old, Midshipman (TrueNicks) was somewhat quiet with his juveniles, although he did have stakes winner Naval Command (out of a Fusaichi Pegasus mare). 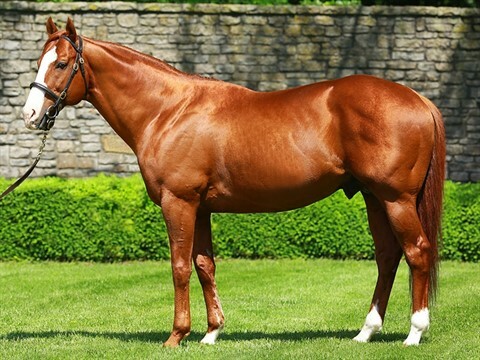 He's shown to better effect early in 2015, however, with the very rapid black-type scorer Lady Shipman (whose dam is by Mutakddim, a parallel Mr. Prospector/Seattle Slew cross to Midshipman), and the fast-finishing Fountain of Youth Stakes (gr. III) third Frammento (out of a mare by Golden Missile, so also inbred to Seattle Slew). Super Saver (TrueNicks) (Maria's Mon) was one of last year's heroes, with four stakes winners headed by Hopeful Stakes (gr. I) winner Competitive Edge (out of a mare by Cape Town, a reverse Mr. Prospector/Seattle Slew cross to the dam of Super Saver) and grade II scorer and Hopeful Stakes second I Spent It (out of a mare by Sky Mesa (TrueNicks), whose sire, Pulpit, is a parallel A.P. Indy/Mr. Prospector to the dam of Super Saver). That duo are on the comeback trail, and one would expect, in general, the Super Savers to be better at 3 than at 2, with two recent scorers to keep and eye on being Mott N Hester, first-time-out winner at Aqueduct, and Unrivaled, who has put together back-to-back wins, the second being a five-length allowance score at Parx. Looking around the world, Tale of the Cat (TrueNicks) has been a very useful minor sire of sires, and his most recent son to be represented by a stakes winner is second-crop stallion Take of Ekati (TrueNicks). He has the dual graded-stakes-winning filly Ekati's Phaeton, who is out of a Capote mare and is inbred/linebred to Mr. Prospector, Halo, and Nijinsky II, three of Tale of Ekati's four grandsires. A half brother to Discreet Cat (TrueNicks)—who's quietly become a very good value-for-money sire—Discreetly Mine (TrueNicks) occupies eighth place among the second-season sires of 2015. He has a current stakes winner in Control Stake (out of a mare by Quiet American), the multiple graded-placed Classy Class (out of a mare by Saarland, like Quiet American from the Fappiano line), and the graded-placed filly Starlet O'Hara (dam by Gilded Time). Given his pedigree and performance, Blame (TrueNicks) wasn't a horse who would have been expected to come through with early 2-year-olds, but he does have what looks to be a very promising 3-year-old in Far From Over (dam by A.P. Indy), who won a remarkable renewal of the Withers Stakes (gr. III). He did also have three graded-stakes-placed juveniles in No Fault of Mine (out of a mare by A.P. Indy son Flatter), Don't Blame Me (dam by Forestry), and Hollywood Critic (dam by Kaldoun). The top 10 is rounded out by the late Summer Bird (Birdstone). He has 18 winners to date, including the Forward Gal Stakes (gr. II) scorer Birdatthewire (out of a mare by the Conquistador Cielo sire Wagon Limit). Further down the list, last year's leading freshman sire Quality Road (TrueNicks) is awaiting the reappearance of his two 2014 stars, Hootennany and Blofeld, but has added the Busanda Stakes winner Overprepared (out of a mare by Dayjur). We'll also note a pair of Lion Heart horses in Line of David (TrueNicks) and Kantharos (TrueNicks). Line of David has California Derby winner Cross the Line and is only two photo finishes away from having two more stakes winners among his total of six stakes horses, most notably the Los Alamitos Futurity (gr. I) second Firing Line. Florida's Kantharos has eight stakes horses, including stakes winner Mr. Jordon, and the graded placed X Y Jet. Finally, we'll give a call to Temple City (TrueNicks), who surprised with a trio of juvenile stakes winners headed by the With Anticipation Stakes (gr. II) scorer Startup Nation. Another of last year's black-type winners, Bolo, who scored on turf, recently ran well when trying dirt in the San Felipe Stakes (gr. II). There is no doubt that the next six months will see another reshuffle of these names with stallions coming in and out of favor as their first crop run through their classic year. But if history is any judge, the sires that find long term sustainable success must prove to be more than one-hit wonders. For that reason, we will closely observe the performances of these stallions' second crops that will hit the track in the next few months.